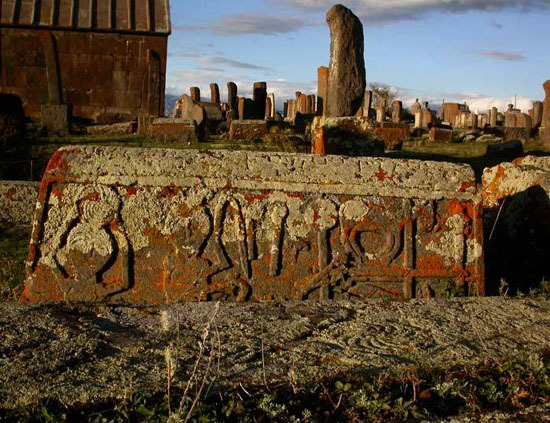 After the destroyed Armenian cemetery of Julfa, let us see now a medieval Armenian cemetery that has survived. Photos mainly by Julia and Vitaly Hachatryan (see below). 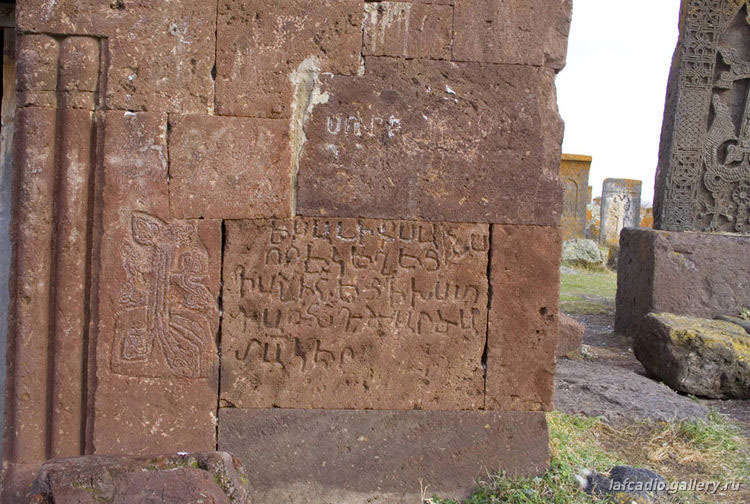 Noratus – this is how the Armenian Նորադուզ is transcribed, but it is also often written as Noraduz, perhaps because this is how it is locally pronounced – is a village of some thousand inhabitants in Armenia on the western shore of Lake Sevan. 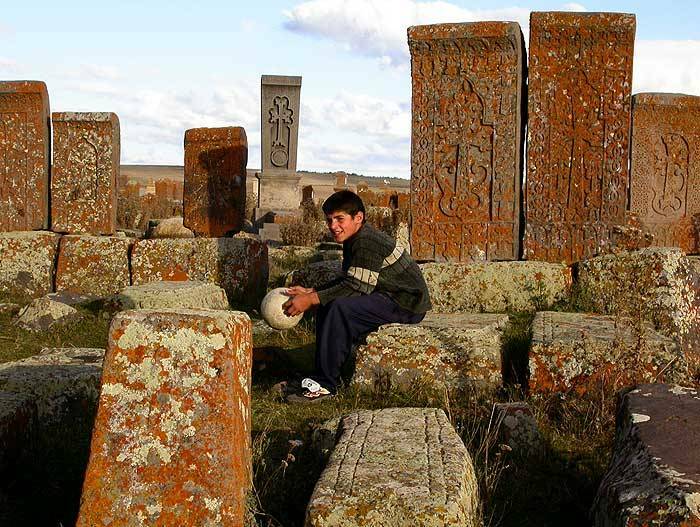 On the border of the village facing the lake extends on seven hectars – eighteen acres – the cemetery which, after the destruction of the khachkars of Julfa, is the largest medieval Armenian cemetery with its almost thousand carved headstones. 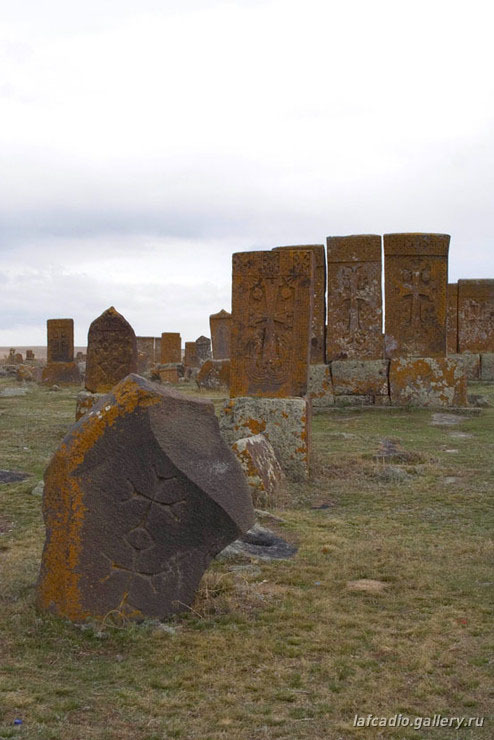 The cemetery is quite unknown not only abroad, but even in Armenia. 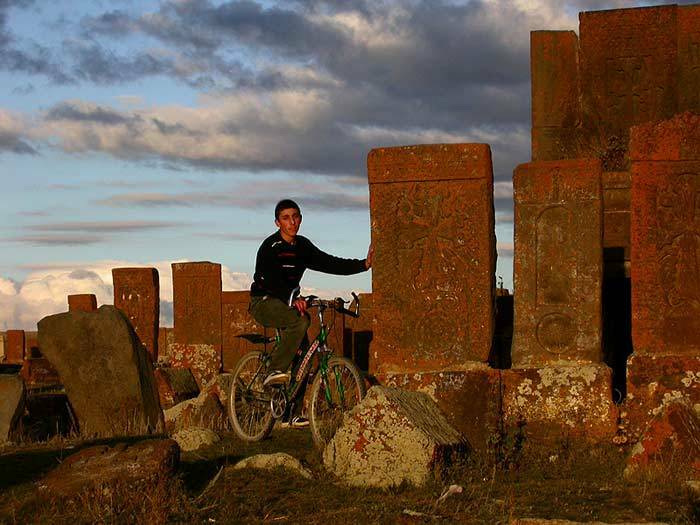 Hairenik, author of a good English-language Yerevan blog who regularly reports on his excursions, had not known about it until he had to guide a foreign photographer there. Nevertheless, photographers sometimes do find it. On the net there are some photos of it here and there, but it is shocking to see how much difference can there be between photo and photo, eye and eye. 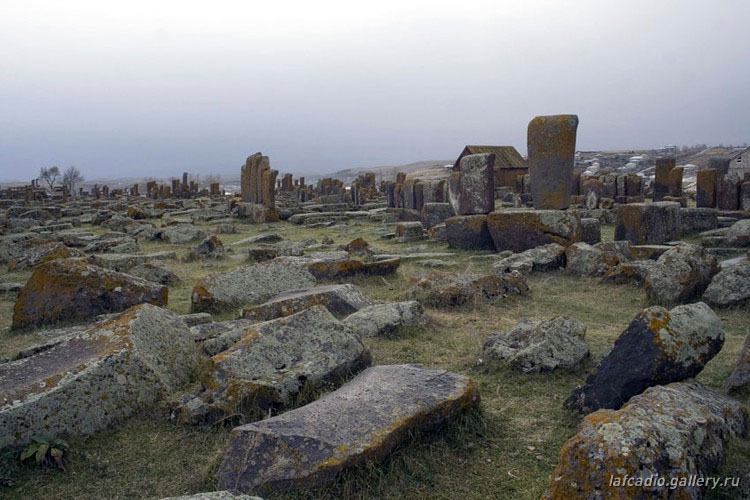 However fascinating the cemetery is in the reality, only a few photographers can render this impression in their pictures. Two of them, Vitaly Hachatryan and Julia nevertheless managed to do so in a sovereign way. The pictures here are mostly theirs. 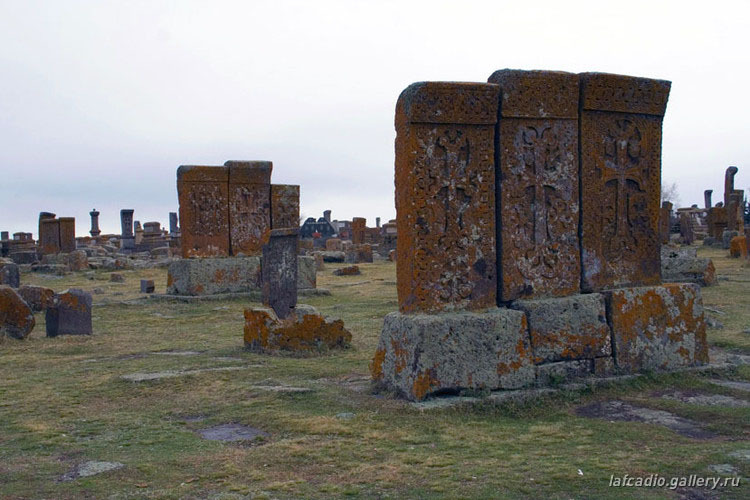 The thousand headstones of the cemetery were made between the 9th and 17th century, and thus they embrace the complete history of khachkars, “cross-stones” from the simplest rustic carvings to the masterpieces with infinite tracery from their golden age in the 13th and 14th century. One has the feeling of visiting an open air museum. From this point of view it is even more comprehensive than the destroyed cemetery of Julfa was, for the almost ten thousand stones of Julfa were mostly made in the period between the 14th-century boom of the city and its depopulation in 1604, while in Noratus they were continuously carved since the time when King Ashot I, who unified Armenia after the Arabic invasion, erected in 879 the first khachkar in memory of his wife. 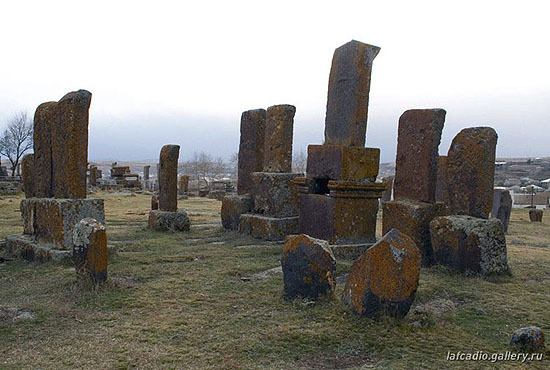 The history of khachkars nevertheless goes back to a much more ancient time. 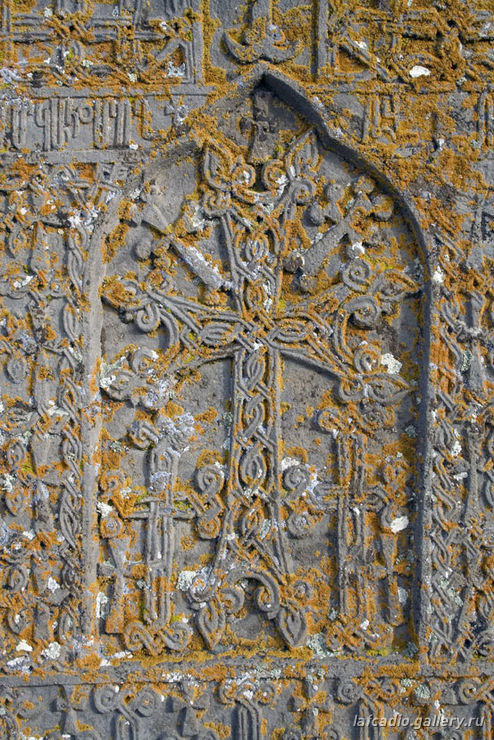 The cross with leaves had been a favorite motif of Syriac Christianity since centuries. 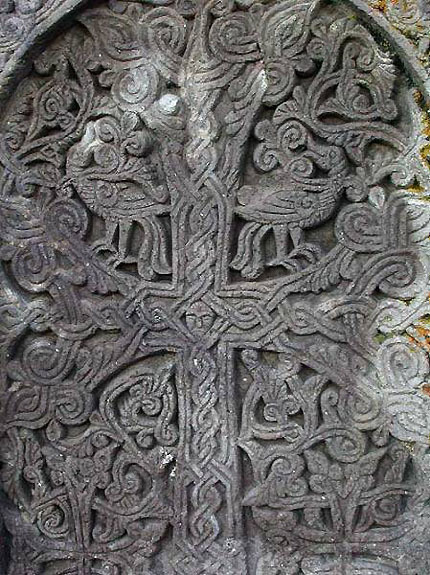 This was the “Nestorian cross” taken by agile Syriac merchants and missionaries not only to the Armenians, but also to China and Southern India. 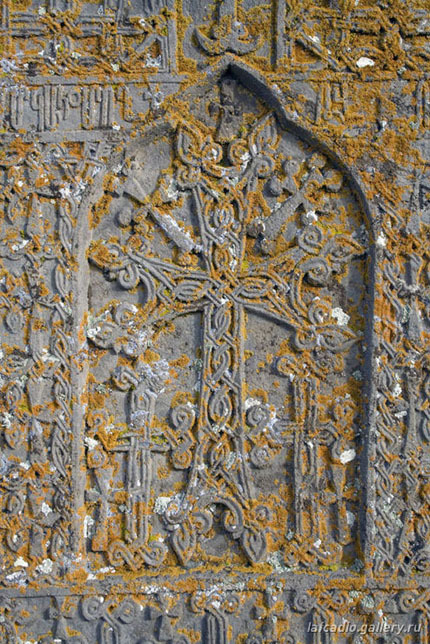 It is quite startling – we also want to write about it later – to see such crosses, a thousand and six hundred years old, with Syriac and Old Persian inscriptions, on the altars of small Christian churches in the middle of the jungle of Kerala, which were brought there from the Armenian-Syriac borderland by the ancestors of the still today flourishing local Syriac Christian community. But the fact that such crosses with leaves in Armenia became monumental open air steles was also due, according to the literature, to the ancient tradition of local “vishap stones”, fish-formed dragon steles that had been erected on the shores of rivers and lakes in honor of the fertility goddess Astghik. 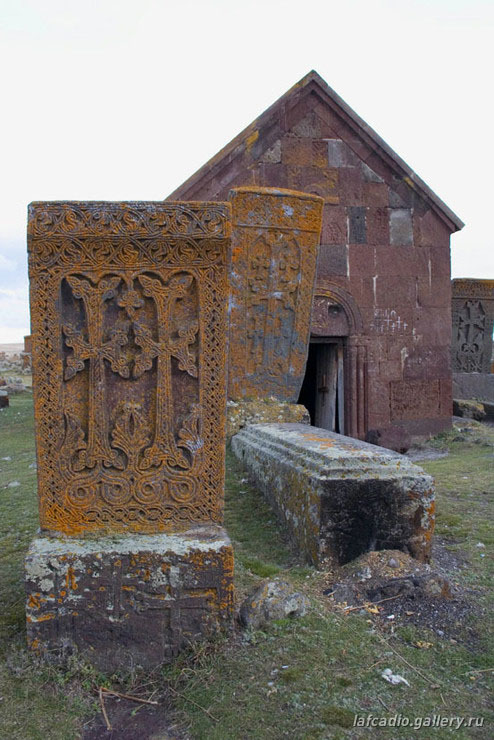 The tradition of these columns being Christianized with the motif of the cross produced the most characteristic genre of medieval Armenian art. 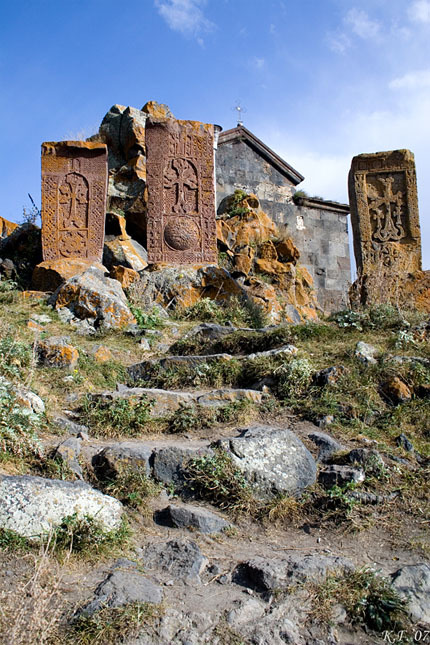 Its development was also influenced by the Monophysite confession of Armenian Christianity which emphasized the divine nature of Christ, and thus represented the cross without corpus, standing above the disk of the sun, its materiality being dissolved in an infinite plaitwork and elevated to a transcendental level. 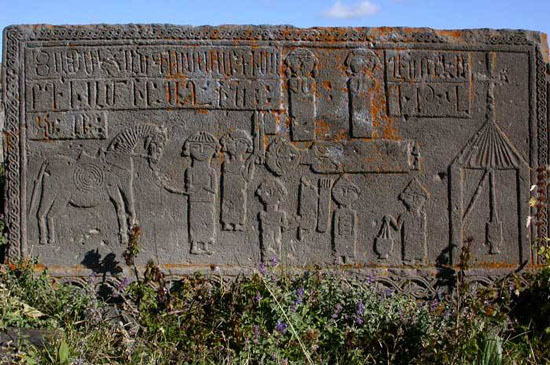 In Noratus besides the khachkars there are also several examples of another type of Armenian gravestones, the lying steles representing an elaborated scene of the life of the deceased: a warrior returning from war with his loot, a knight playing on the lute, a wedding ceremony, a craftsman in his workshop. 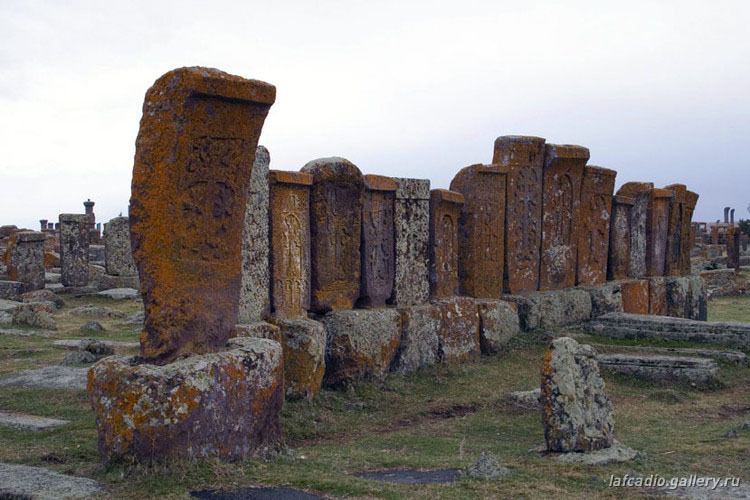 The steles stand on the barren plateau shoulder to shoulder, like soldiers lined up. 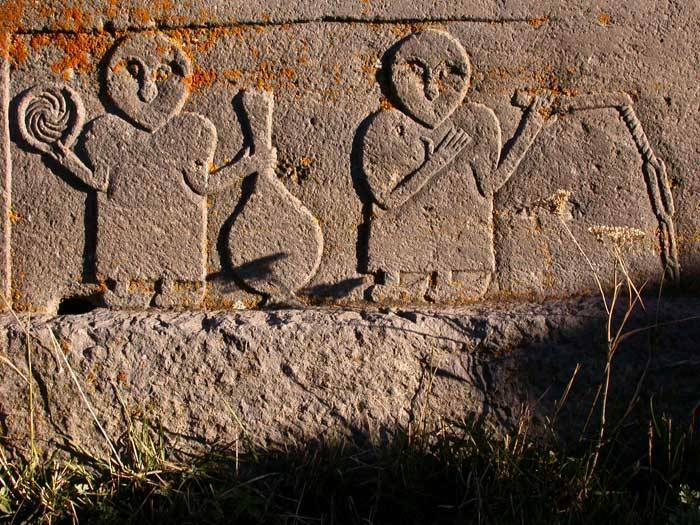 This sight also inspired the imagination of medieval Armenians. 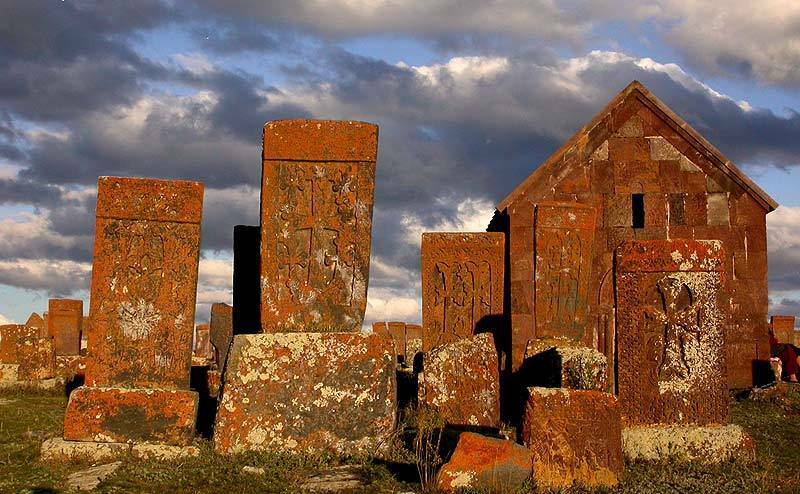 A local legend has it that when the army of Timur Lenk invaded Armenia, the inhabitants of Noratus placed helmets on the top of the gravestones and leaned swords against them, and the enemy retreated from the sight of the mighty army on the hilltop. The legend, however, probably only expressed a pious wish. 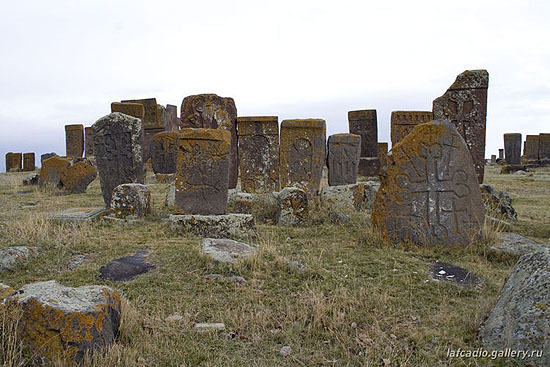 The army of Timur Lenk did visit Noratus, but they did not retreat without a result. They destroyed the 9th-century fortress and the church of Astvatsatsin, that is the God-bearing Virgin in the middle of the village. 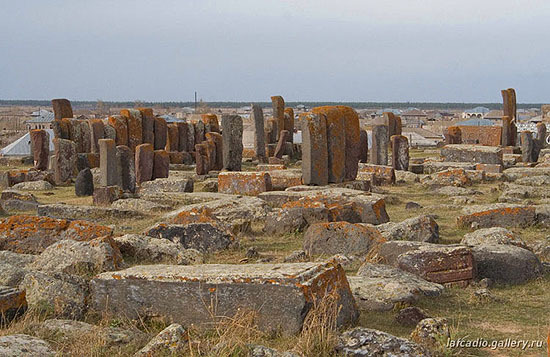 Their ruins are still visible. The presence of such a rich cemetery as well as a large church and fortress here, at the borderland of medieval Armenia is surprising in itself. However, it is even more surprising that at the southern border of the village there was also a 9th-century monastery dedicated to the apostle of the Armenians Gregory the Illuminator, whose church has survived until today. 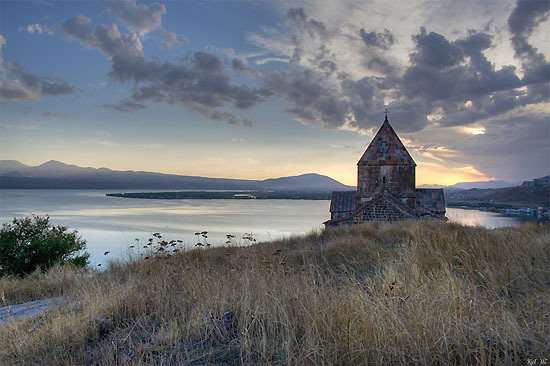 And to the north of the village, on the shore of Sevan still there is the monumental 9th-century monastery of Hayravank, encircled with several more khachkars. 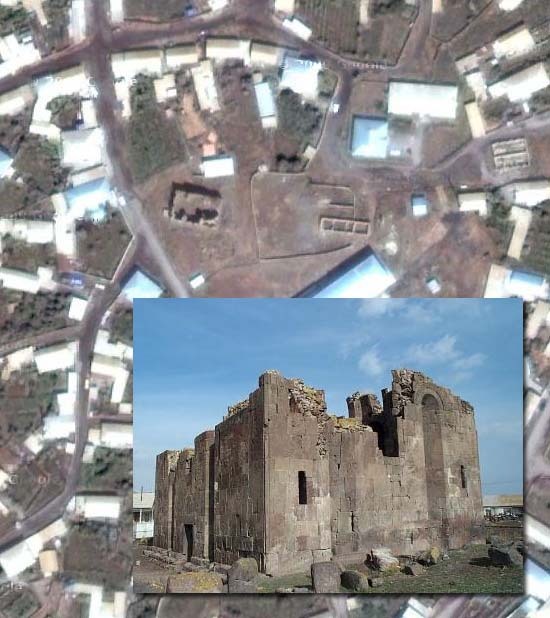 The map of Noratus and Hayravank from armenica.org, with a red cross indicating the place of the cemetery. 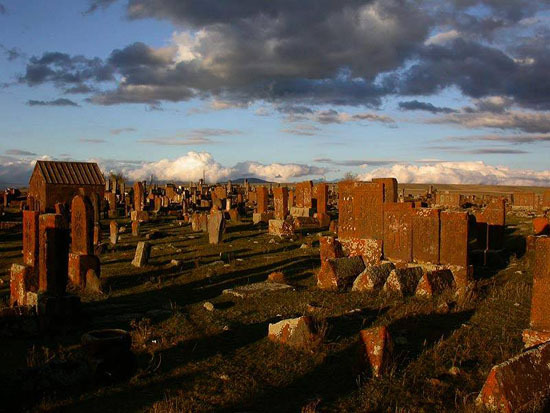 The town of Gavar (originally New Bayazit) was founded only in 1830 by those thirty thousand Armenians who fled the Turks following the retreating Russian army from the town of Bayazit (today Doğubayazit) on the Turkish-Persian border. 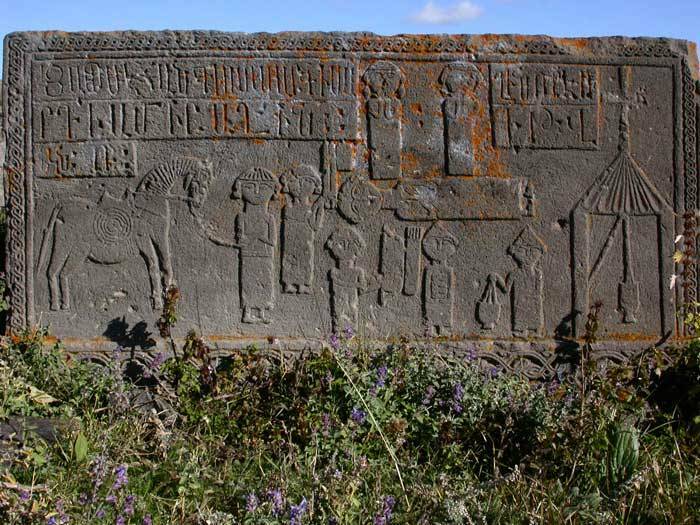 Before that probably Noratus was the center of the region. At the sight of these monuments one almost feels the need of supposing a history of equal importance. However, this is not the case. 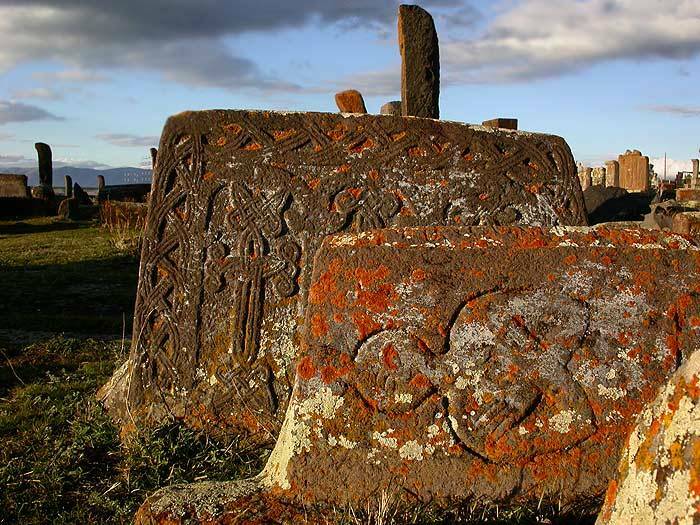 As for example the greatest Romanesque monuments of Hungary, the churches of Ják or Lébény stand in villages that were out of the way of “big history” , similarly several of the most beautiful monuments of Armenian architecture were built far from the large centers. The reason was also similar. 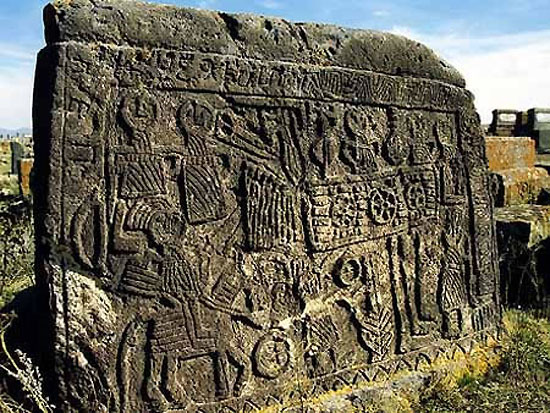 The 9th and 10th century were a period when Armenia was free for a while of Byzantine and Arab invasions, and both its political and economic development could start under the Bagratuni dynasty – but in the same time the dynasty was not yet strong enough to limit the autonomy of local lords. This state of equilibrium favored the establishment of a large number of splendid local centers, a great part of which – or at least their churches – have survived until today. 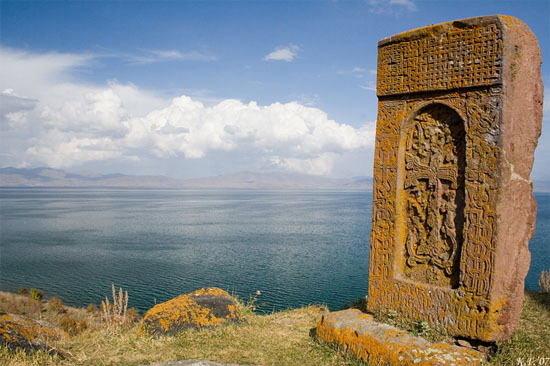 The western shore of Sevan was the center of the western branch of the princes of Syunik. 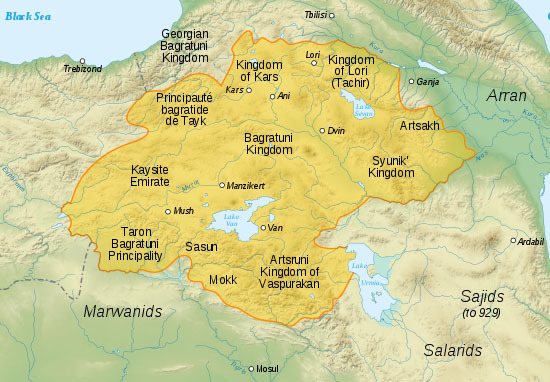 This principality, divided into a complex network of branches – their Russian monograph can be read here –, together with the strong Kingdom of Vaspurakan remained more or less independent of the Bagratuni Kingdom, until in the 11th century Byzantium and then the Seljuk sultanate occupied them all. 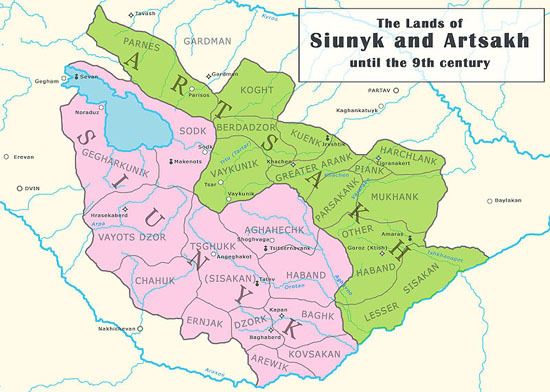 The Armenian principalities of Syunik and Artsakh (this latter known outside of Armenia as Karabagh) at the beginning of the Armenian revival in the 9th century. Lake Sevan seen from the Monastery of Sevan, which was built in the 9th century by Mariam, daughter of the unifier of Armenia King Ashot I Bagratuni, and wife of a Syunik prince, at the border of the two kingdoms, on the northern island of the lake. 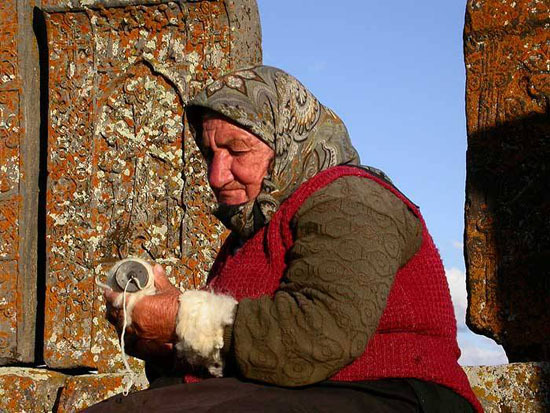 This video of less than two minutes was found on an Armenian site. 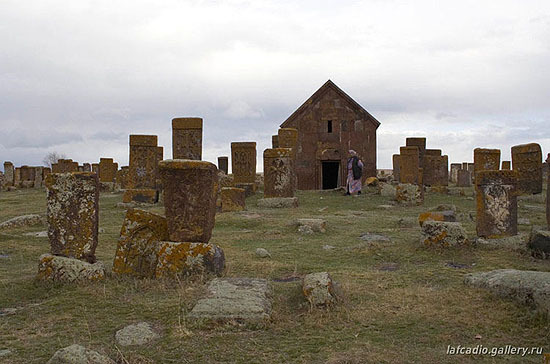 An obviously local guide presents the cemetery. He speaks in Armenian, without subtitles, but it is worth to listen to it just for the music of the language. And also because he is so similar to those one-time local guides – teachers, sacristans, literate people – who even just twenty years ago offered their services at village monuments in Transylvania or Bohemia. 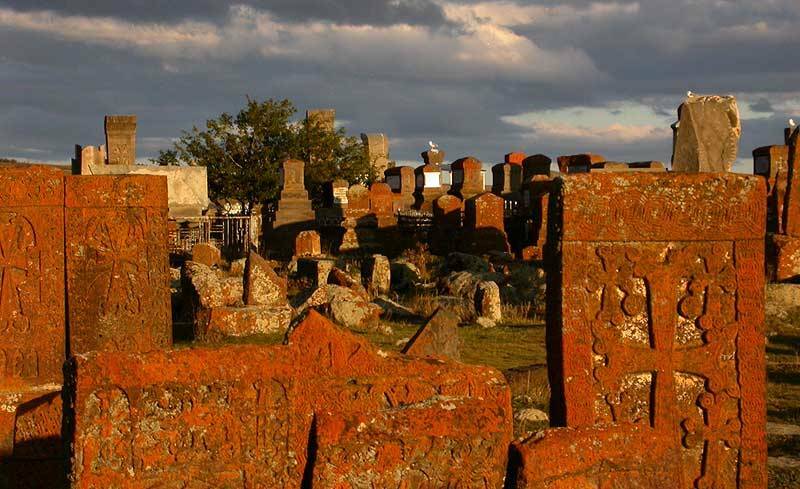 In general, this whole region, this peculiar constellation of desolation, richness and destruction again and again recalls memories of Transylvania. 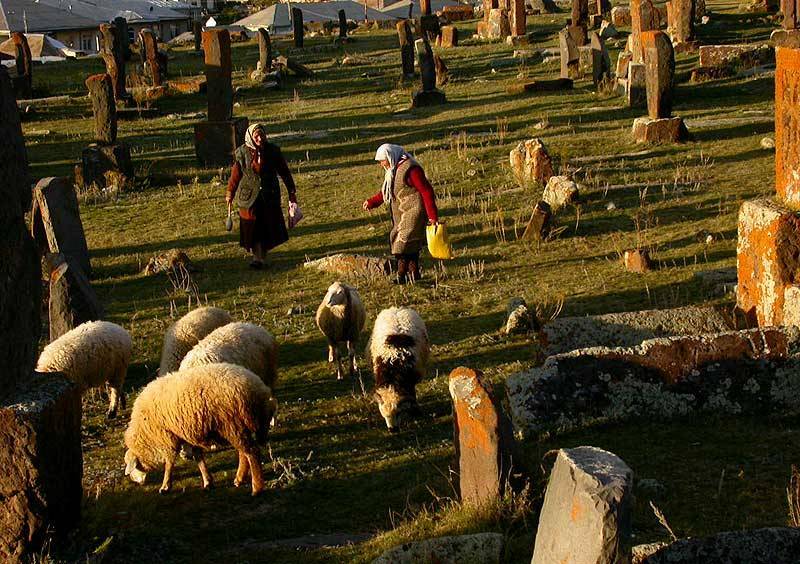 Among the tombs sheep are grazing, children play, old women spin the wool and offer for sale the woolen socks knitted on the spot. The scenes of past and present lives melt together. 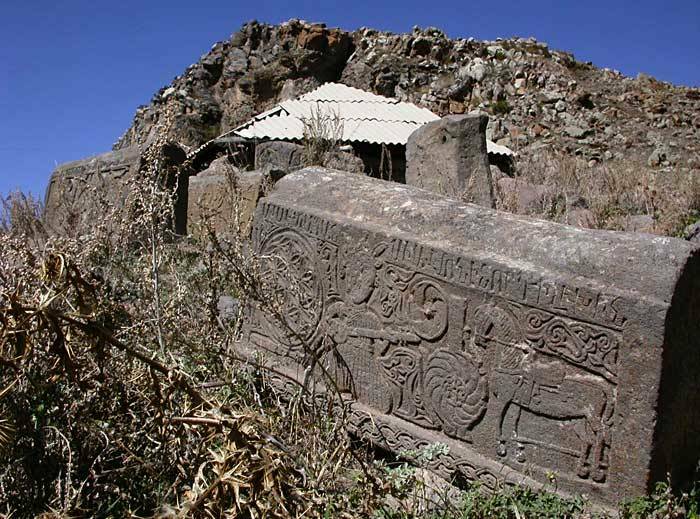 I was taken by the magnificence of the silent steles and the enlightening and sensitive remarks of the post. Especially when the sight of this desolated landscape is evocative of nostalgic memories of Transylvania. 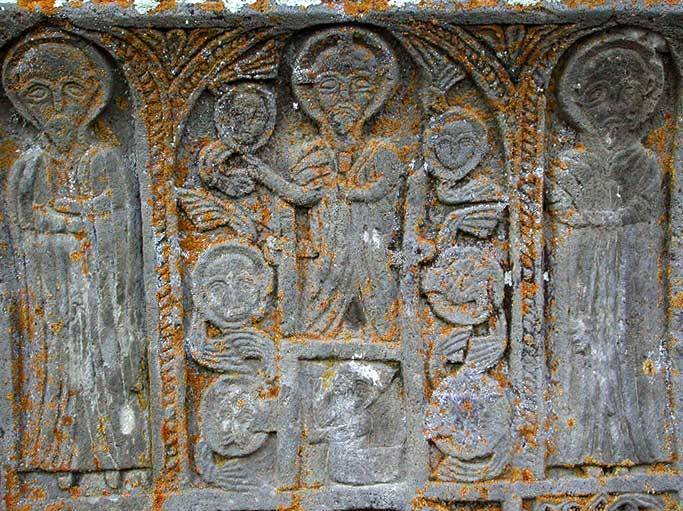 Las ornamentaciones de las khachkar (no sé si serán femenino o masculino, o ninguno de los dos pero en castellano suenan femenino) especialmente las de los siglos XIII y XIV, me dejaron totalmente enamorada y encantada del lugar. 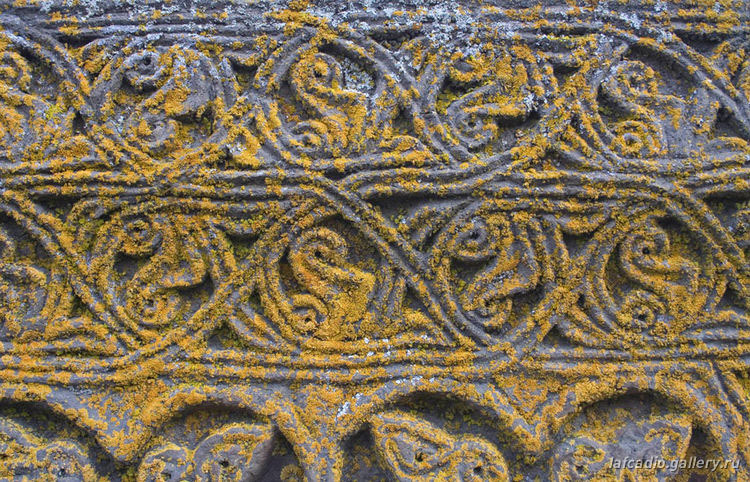 Es notable además ese tono ocre o naranja que tienen, al parecer por algún tipo de liquen, musgo u hongo que cubre todas las superficies del lugar, según se ve en las fotos tomadas de cerca. ¿Encontraste alguna referencia que explique esto en tus investigaciones sobre el cementerio? 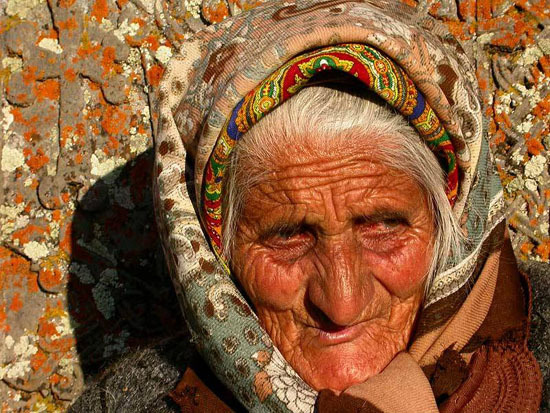 Y por último son preciosas las fotos de la mujer del final, con su piel del mismo color que las piedras y una pose de juvenil timidez absolutamente encantadora. Thank you, Poly. 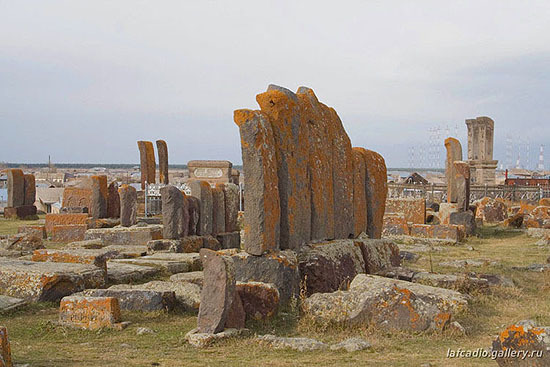 In fact I was taken by the same feeling at the first sight of these stones. 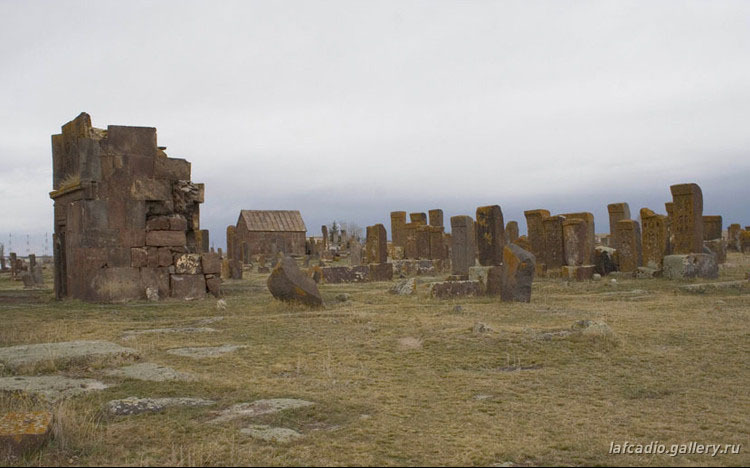 And it is really strange that landscapes so far from each other can be so similar to each other and so familiar, “déjà vues” to someone coming from one of them. «Khachkar» tendría que ser femenina (cruz-piedra), aunque no es fácil decirlo porque en el armenio no hay géneros gramaticales. 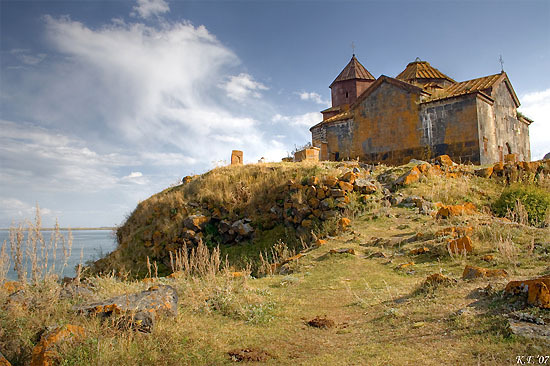 El ocre me parece el color natural de la piedra, mas los fotógrafos mismos escriben que todas son cubiertas de un típico liquen del lugar, alimentado del microclima húmedo del lago Sevan. 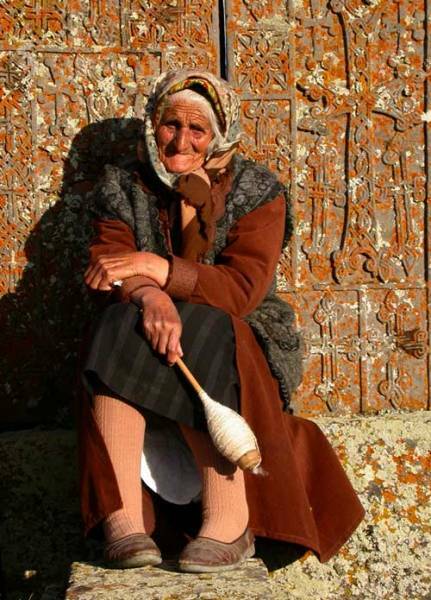 Sí, estas viejas mujeres de las montañas… También ellas me recuerdan fuertemente a Transilvania. No, no creo que el ocre sea el color natural de la piedra, fijate que algunas o partes de algunas orientadas hacia otra dirección no tienen ese color. 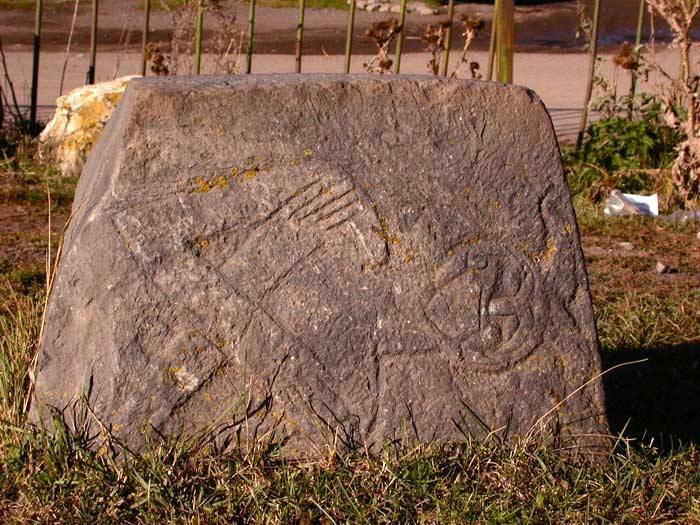 Esa variación según la orientación es típica de los líquenes y musgos, me parece. 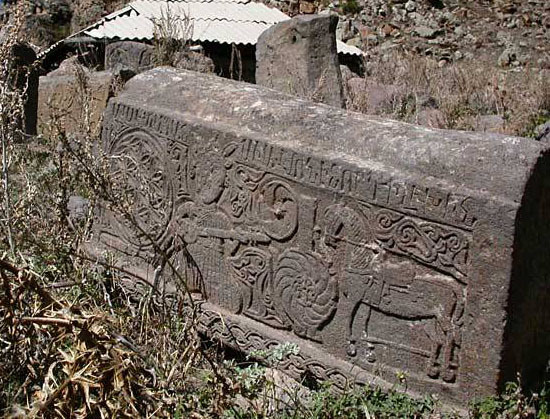 Veo que Wang Wei tradujo también como "las" khachkar en su versión. 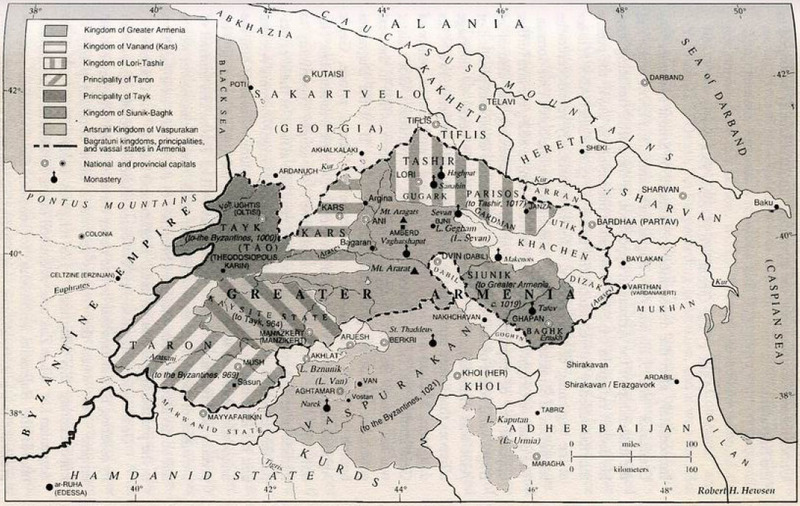 Pero además aclaraste parte de mi duda que era saber si había o no géneros en armenio. Qué lindo sería llegar a vieja con esa candidez en la mirada...! Sí, tienes razón: en las fotos de detalle se ve que el color viene de los líquienes (como explícitamente mencionado también por los fotógrafos). 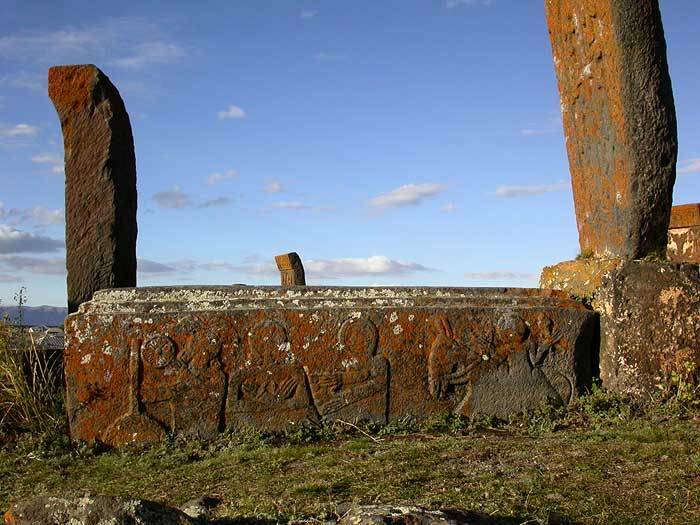 Muchas gracias por compartir la visita de este maravilloso sitio. Fotos y texto muy buenos. Gracias. Mnohokrát Vám děkujeme, Jana. 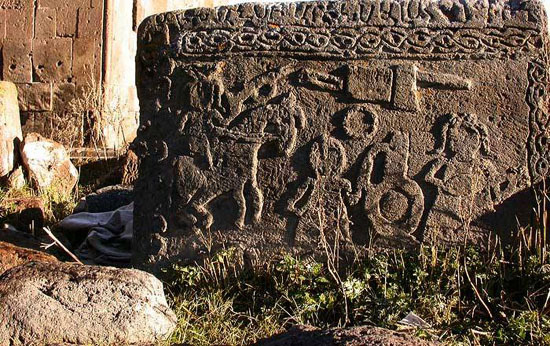 Můžete také navštívit novou verzi našeho blogu, či náš druhý, častěji aktualizovaný a trojjazičný blog na riowang.blogspot.com.